I know that many of you are interested in what we have been doing during our one flexi-school day at home each week. It's going really well and Natty and Mummy are enjoying quality time to enjoy learning together. The topic being covered at school was Healthy Eating and Fruit and Vegetables so I planned a series of activities that covered science, reading, writing, literacy, numeracy and life skills using this topic as an umbrella. 1) We took a shopping bag and went around the kitchen collecting as many fruits and vegetables as we could, including fresh, tinned and dried varieties. We said the names of each aloud. Natty loved putting them in the bag and heaving it around, shouting 'ooooh, heavy'. 3) We took the fruit and veg out of Natty's shopping bag one at a time. This time I encouraged her to remember the names of each item. She needed help with a few and we used Makaton to back this up. We talked about the colour of each item too, again using Makaton as reinforcement where necessary. 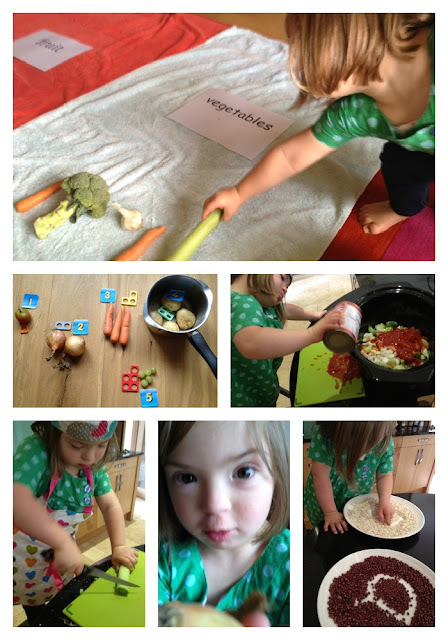 4) I encouraged Natty to decide if each item was a fruit or a vegetable and sort them. There were multiples of some. This was a challenging task, so I helped by saying that fruit are 'sweet and juicy' and that we generally 'cook vegetables'. I added a fruit bowl to the fruit towel and a saucepan to the vegetables one as a visual prompt of this. 5) We moved on to our numeracy task, using our home starter kit of Numicon. This is an invaluable sensory, visual system that uses colours and shapes to represent each number. Natty found 1 tomato, 2onions, 3 carrots, 4 grapes and 5 potatoes and so on. We set them out on the floor in order and then Natty matched the numeral and the Numicon shape to each number set. 6) After a little break and a healthy snack of one of the bananas and some grapes, Natty and I went back to the kitchen to prepare a homemade vegetable soup. We took all the vegetables from the first activities. Natty washed her hands and put on her chef's set. I went to Spotify to find some vegetable themed songs to play (there were scores of them!) and off we went. I was very nervous about Natty using a serrated knife to chop, but she did very well with guidance although my heart was in my mouth the whole time. You know your child and what they are capable of. Always supervise such activities closely. Natty then poured in the liquid and stirred while dancing. The amusing moment Natty remembered she'd taken off her apron earlier! 7) We tidied up and had some lunch and then began our writing practice. We wrote 'a' 's' 'p' and 't' in plates filled with oats and dried beans, then on each other's backs, in the air, on the floor. We wrote the letters on paper (Natty finds a rubber pencil grip helpful for pencil control) using the Ruth Miskin ideas for formation ('a' round the apple and down the leaf...), firstly tracing over dots and then freehand. 8) Time for a quick burst of literacy practice. We went through the flashcards in Natty's current book (one from the Oxford Reading Tree series), then matched the cards to the 'same' words in the text. We then read the book and talked about the story. Mummy was shattered and in bed by 9pm! Thank you! It's all new to us but we are learning. What a great idea, to use real food.